The difference: The Luxury Well is a team of people that love and collect watches - we are not just another secondary market dealer, but we want to forge long-lasting relationships with our clients and provide genuine consulting and sales services that surpass even the most discerning collector's expectations. Today, we are offering a brand new and unworn NOMOS Glashütte Zürich White Dial Ref. 801 with all box and papers. 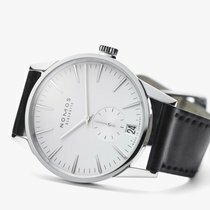 This is a genuine Nomos watch, and we guarantee authenticity. The watch comes with the original NOMOS Glashütte Zürich White Dial and with the original NOMOS Leather strap. Everything in this offer is exactly the way you get it from the authorized NOMOS retailer as we sourced it from an authorized retailer. All papers, boxes, tags, etc. are included. The watch comes with a full factory warranty. The warranty card will be stamped and dated as of the date of the successful sale. The current retail price for this watch is $4,480. We are offering it today considerably below wholesale cost. The watch is brand new and unworn and free from any blemishes. The exact condition of the watch can be seen in the pictures. The watch runs perfectly fine to specifications. Please make sure to also check our YouTube channel "The Luxury Well" for a video that shows the factory fresh condition of the watch in great detail. Description: Stainless steel case with a black leather strap. Fixed stainless steel bezel. Galvanized, white silver-plated dial with silver-tone hands and index hour markers. Minute markers around the outer rim. Dial Type: Analog. Small seconds sub-dial above the 6 o'clock position. Automatic movement with a 43-hour power reserve. Scratch resistant sapphire crystal. Transparent case back. Case size: 39.7 mm. Case thickness: 9.55 mm. Round case shape. Tang clasp. Water resistant at 30 meters / 100 feet. Functions: hour, minute, second. Additional Info: leather strap is made of shell cordovan. Casual watch style. Watch label: Made in Germany. Nomos Zurich Automatic Steel Mens Watch 801. The watch shown in the pictures is the actual watch for sale. These are not stock photos. We guarantee authenticity and accurate representation. Any material deviation from any of these representations entitles the buyer to a return of the watch. Beyond that, all sales are final. We include free shipping with FedEx to addresses in the continental U.S. as well as low rate 2nd day and overnight express options. International shipping is also done with FedEx Express Intl. Priority mail at affordable rates and is typically delivered within 2-3 business days. Please note that NJ sales tax is due for shipments to New Jersey. Please also note that you might incur import duties and taxes for any international shipping destinations. We ship to over 80 countries and are very experienced with customs paperwork. For further questions, please never hesitate to contact us. Good luck!